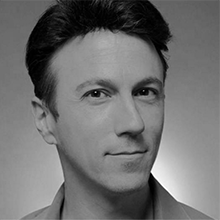 Daniel Kraft is a Stanford and Harvard-trained physician-scientist with over 20 years of experience in clinical practice, biomedical research and innovation. Dr. Kraft chairs the Medicine track for Singularity University and is Founder and Chair for Exponential Medicine (ExponentialMedicine.com) , a program which explores convergent, exponentially developing technologies and their potential in biomedicine and healthcare. Daniel is a member of the inaugural class of Aspen Institute Health Innovation Fellows. Dr. Kraft recently founded IntelliMedicine, focused on connected, data driven, and integrated personalized medicine. He is the inventor of the MarrowMiner, an FDA approved device for the minimally invasive harvest of bone marrow, and founded RegenMed Systems, a company developing technologies to enable adult stem cell based regenerative therapies. He serves as an advisor to many healthtech startups, as well as Qualcomm Life and to the Xprize. Daniel is a Kauffman fellow and venture partner Exponential Partners. Daniel is an avid pilot served for over 12 years as a officer and flight surgeon with an F-16 Squadron in the California Air National Guard. He has conducted research on aerospace medicine that was published with NASA, with whom he was a finalist for astronaut selection.